I’ve decided not to continue past Hanoi, and instead go for a short tour in my own backyard of the Pacific Northwest to cap off my travels for now. My patience with Southeast Asia is wearing thin. In the beginning of June, I’ll be flying to Seattle or maybe Vancouver Island to bike from there to Eugene. So, if anyone’s in the area and isn’t, you know, being a productive member of society with an income and responsibilities, you’re free to come and join me for a ride or two. I imagine I’ll pass through Seattle at some point, and then Portland a little later if I feel like making the detour at the time. I’d like to bike up the Columbia Gorge and then onto the Oregon Outback route and then down to Klamath Falls, again, if I feel like it. We don’t have many pictures together. 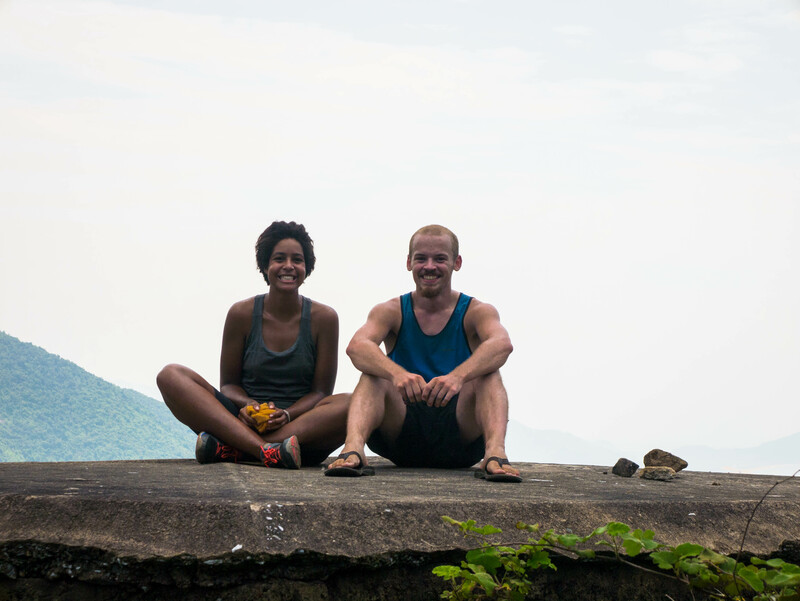 This one is from the top of the Hai Van Pass. Rocks for artistic touch. 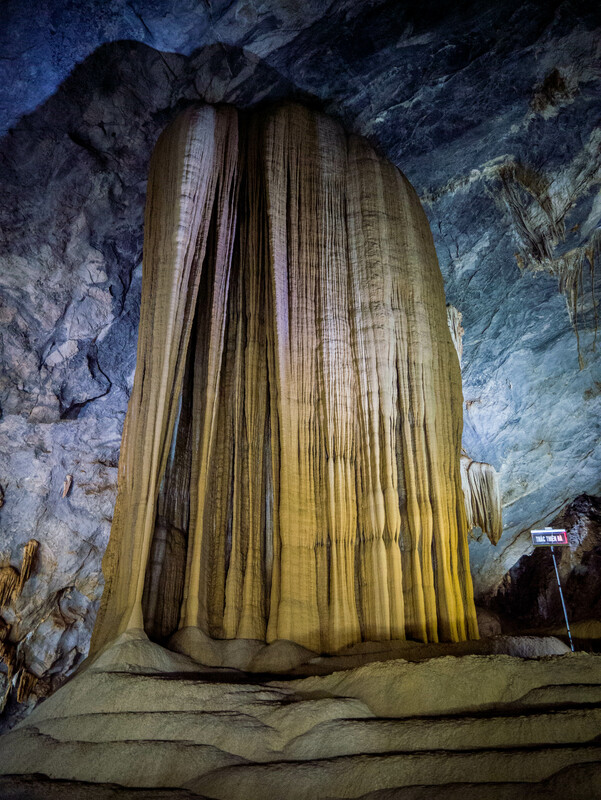 We’re back on the Ho Chi Minh Highway today to visit one of the largest cave systems in the world at Phong Nha Ke-Bang. From Da Nang to here has been a nice stretch but a little more stressful than we would have liked. After the experience in the highlands, we’ve been taking it slow through here, enjoying some western food and lots of protein. I sweated an uncomfortable amount during this climb. 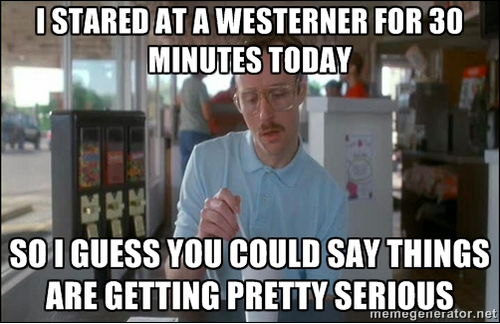 The last few days can best be described as nice riding with periodic moments of stress and/or terror. 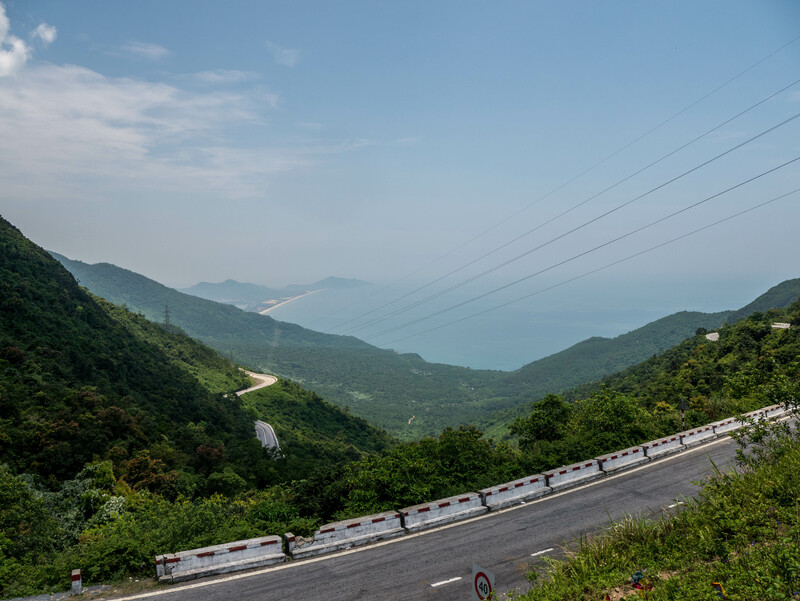 Out of Da Nang, we had to get over the famous Hai Van Pass along the coast. 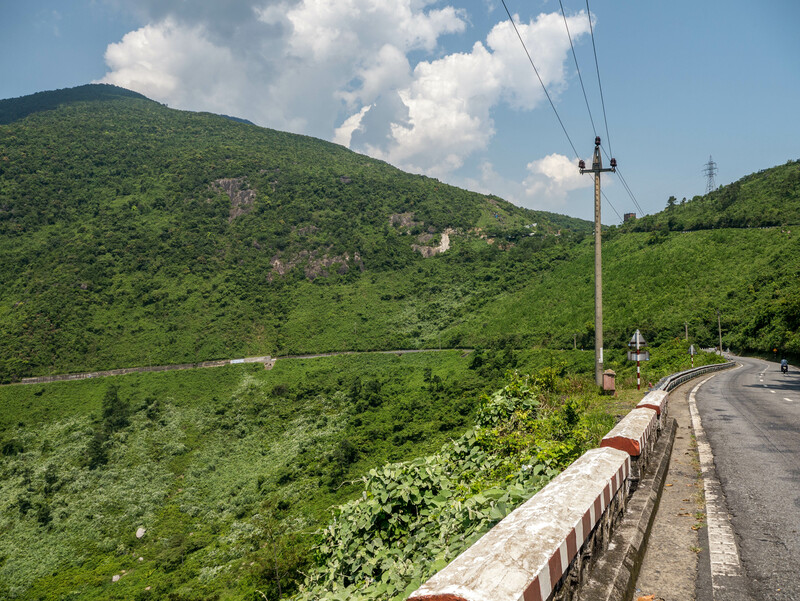 This is the pass that has traditionally physically divided North and South Vietnam through history, as it’s about 500m high, without an easy way around it. It used to be the main highway, with trucks and traffic all along it, but in 2005 they built a big tunnel under the pass which cuts the driving time between Da Nang and Hue by about an hour or so. Now the old road just sits there, beautifully cut into the mountain providing gorgeous views of the coastline. 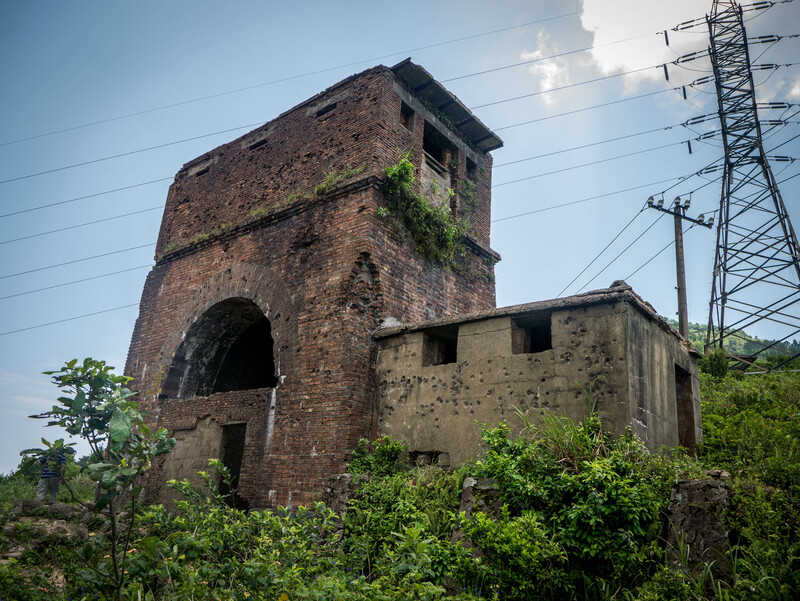 There are forts on top of the pass with bullet holes in the walls from the War. Remnants from when the pass was a particularly strategic military outpost. 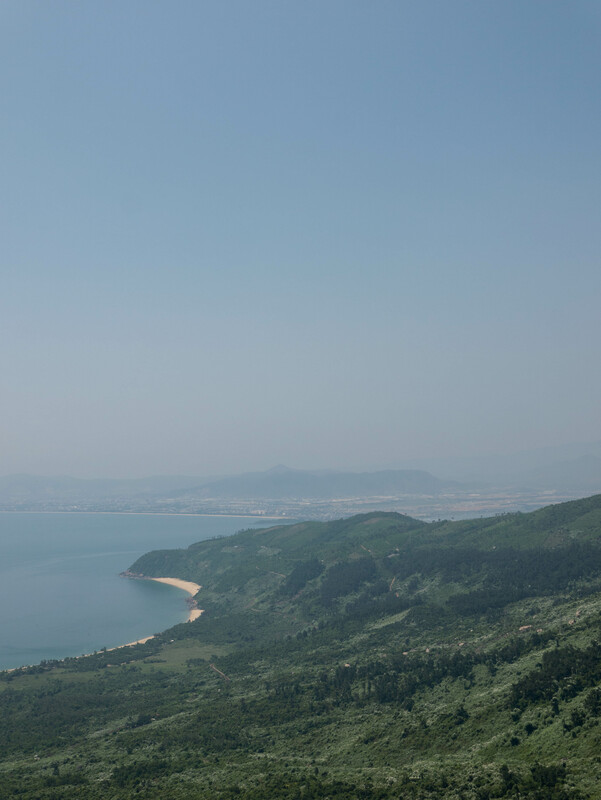 Da Nang from Hai Van. Getting up the pass that day was tough. The road snaked and switchbacked up the mountain, and it was very hot all morning. Would have been nastier with the traffic of 10 years ago though, and the views from the top were stunning. 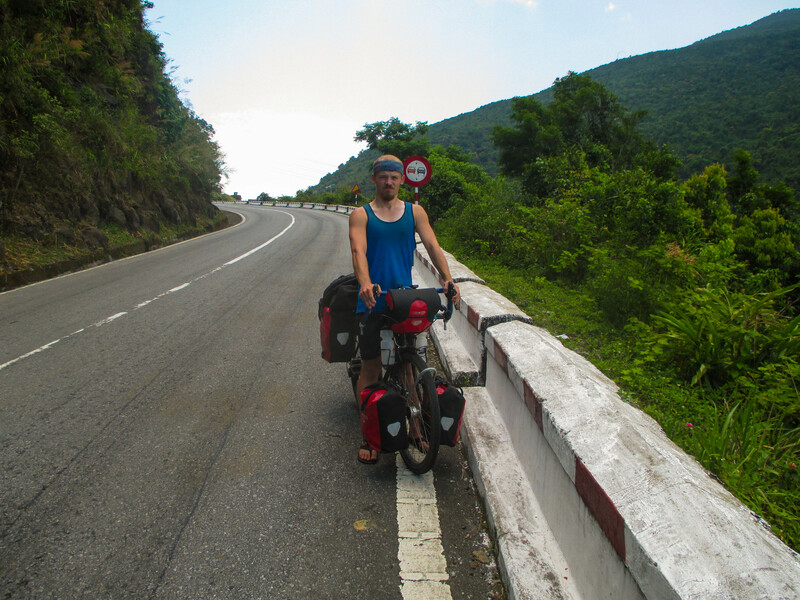 Into Hue, we had our first experience riding on Vietnam’s Highway 1, which goes from Saigon to Hanoi close to the coast. Right now, the whole length of the road is being expanded, and long stretches are under construction. So, the road alternates between newly paved and wide and gravelly two-lane hell with busses blaring horns and doing dangerous overtakes. It’s not very fun, but sometimes there’s just no alternative to riding on it. First moment of terror when I stupidly left my phone and sweat towel on a table at a sugar cane stand and we rode 8km before noticing it. Cue mad dash back to the stand, infinite relief when I found it still sitting there. As it was just getting to the hottest part of the day, it was not a particularly enjoyable backtrack, especially since there were like 50 other almost identical sugar cane stands in those 8km. When there are alternatives, they are nice and usually paved. 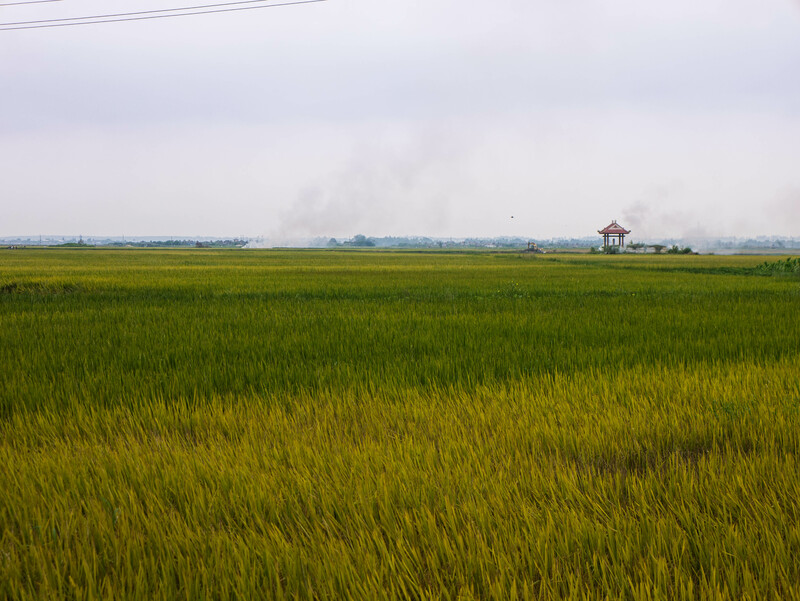 From Hue to a little north of Quang Tri, past the awkwardly planned-but-never-used deserted tourist ghost town of Cua Viet, there’s a nice one-lane road with no traffic that goes through a bunch of rice paddies and small middle-class Vietnamese towns. Very bumpy, but it’s a nice alternative to about 130km of Highway 1 along that stretch. When we cut over to Highway 1 again after the detour stopped, Sophie’s Cambodia tire finally gave out, leading to another moment of terror and stress. She was riding right behind me and felt the tire give out, but because of the traffic I couldn’t hear when she yelled at me to stop. I continued about 6km before I checked my texts and saw a string from her. Cue frustrated backtrack through a particularly nasty part of Highway 1 and attempted replacement of the tire in the oncoming heat of the day. As the usual crowd started to gather to watch us, the terribly-made replacement tire just straight up ripped and the equally terribly-made replacement tube popped. Cue laughter from gathered crowd of Vietnamese people and me almost losing my cool. That final injustice from Cambodia left us hitching and negotiating a ride into Dong Hoi with a bike that barely rolled. 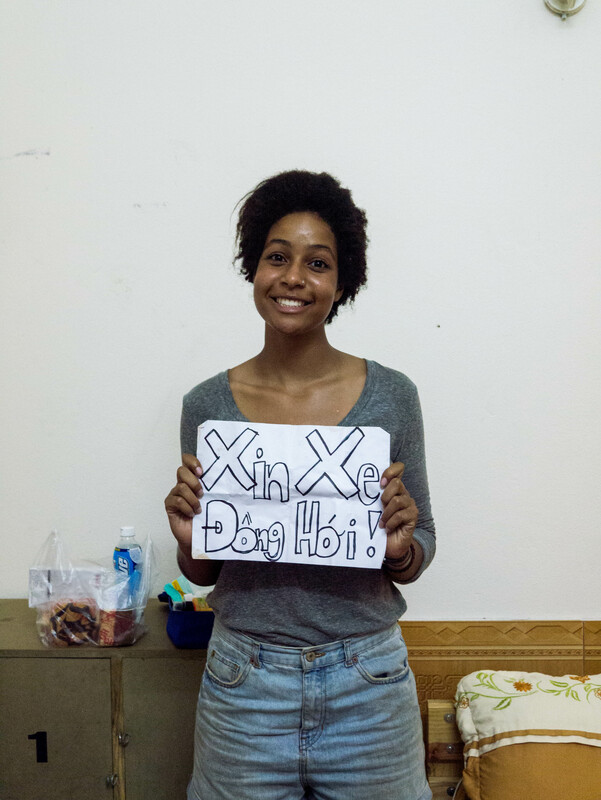 It’s always more stressful setting up the hitch than actually getting a ride, and it ultimately took longer to make our sign in Vietnamese than it took to get a ride. Sign was totally Sophie’s idea, and was probably the reason we got a ride so quickly. 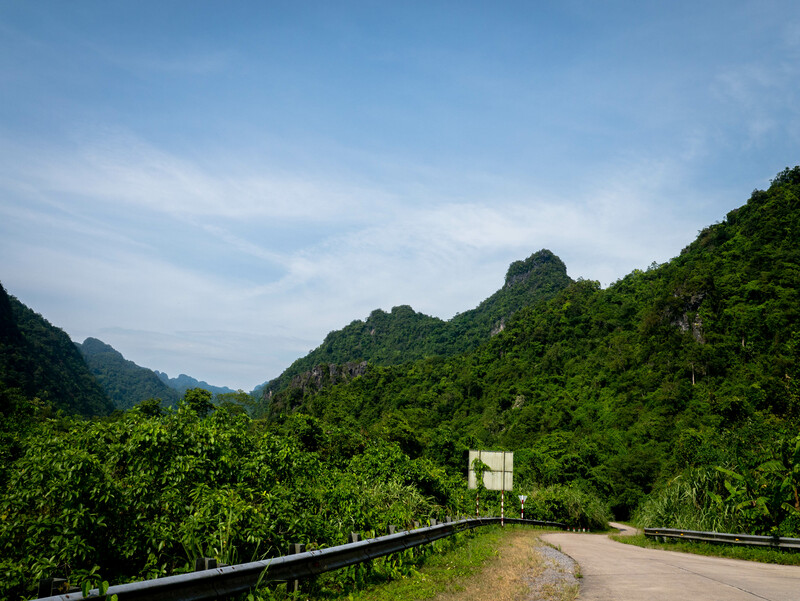 Out of Dong Hoi, which is a nice small town that hasn’t really been hit too hard by the tourist or backpacker crowd yet, we hit the Ho Chi Minh Highway again and headed up to where we are now at Phong Nha Ke-Bang. 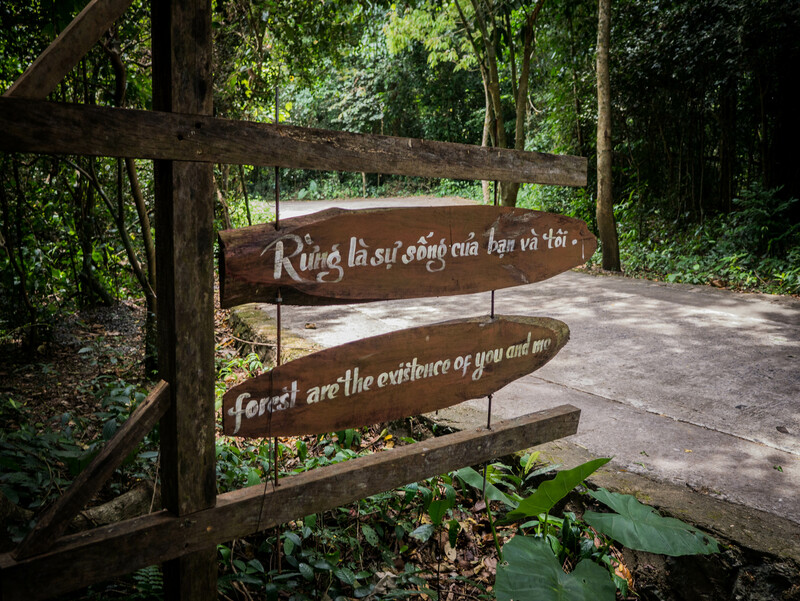 These caves have a fascinating history, as many of them are hidden deep in the jungle and have only really been explored in the last 5-10 years. 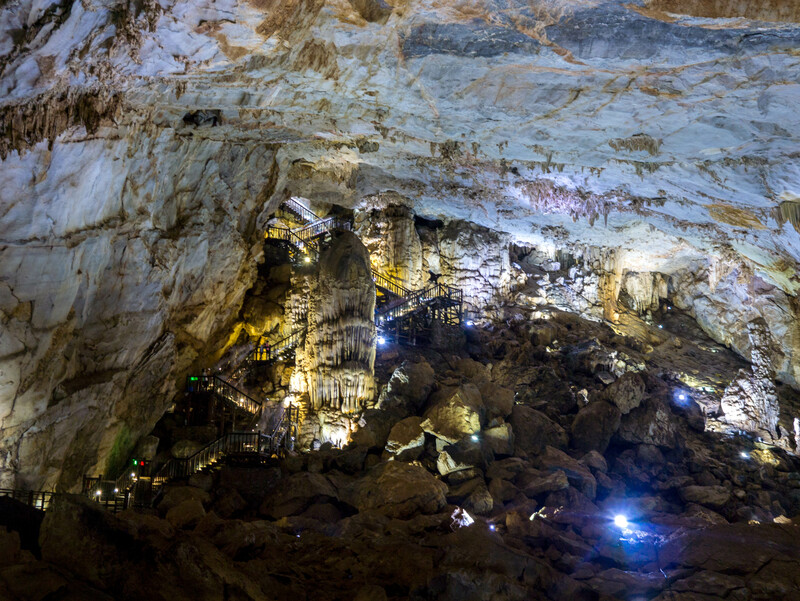 One story goes that a cave was first discovered by a Vietnamese farmer in 2006. When knowledge of the discovery eventually made its way to a British team, they ended up discovering like 11 new caves before they actually found the one they were looking for. One of these caves is large enough to fit all of Manhattan with buildings inside of it, and you may be familiar with the Planet Earth special that showed people BASE jumping into another. The whole park is stunning, and Sophie and I have spent the last few days mimicking that Owen Wilson video that went viral back home a week or so ago. 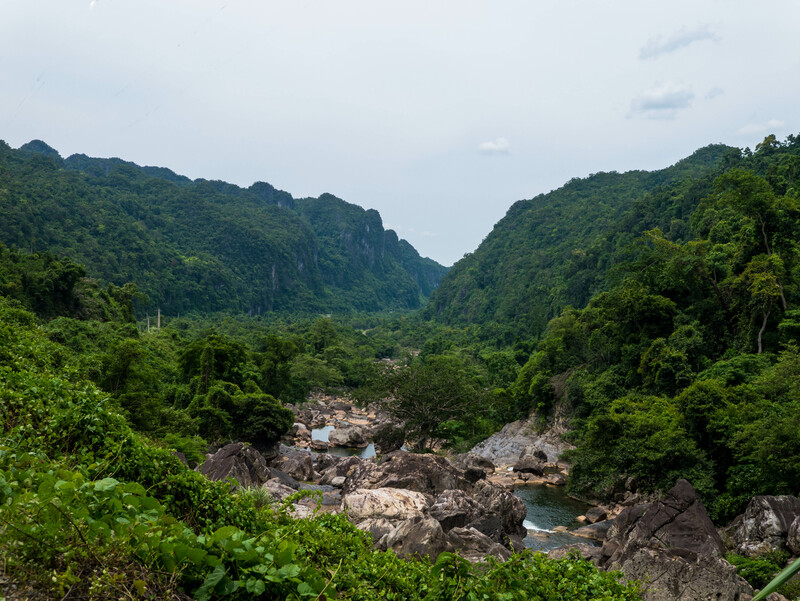 The oldest-known cave was used as a cache for North Vietnamese ammunition during the War, and as a result was bombed relentlessly by the Americans. It still carries scars from this bombing all over the entrance. The whole park is heavily mined, which is a shame because it would be very nice to camp here. A great day riding in this area. Lush jungle roads with little traffic. 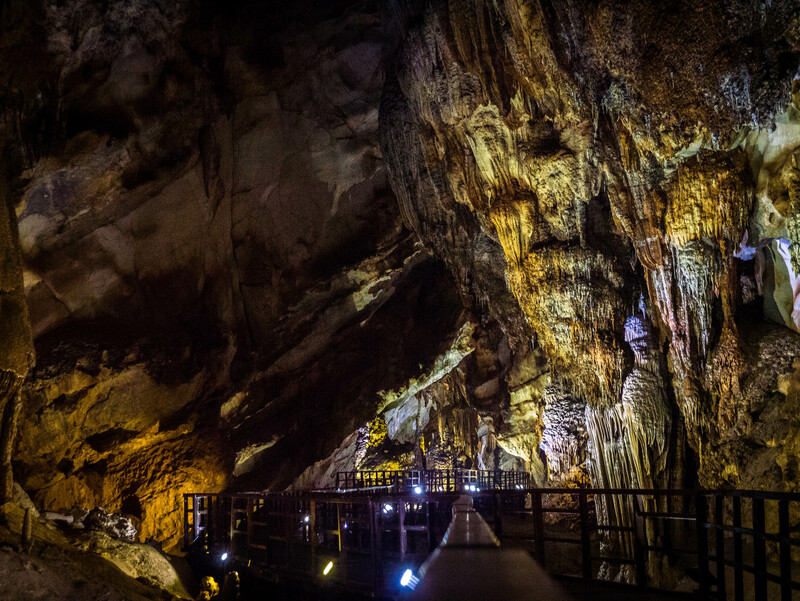 Because of all of this, tourism in Phong Nha Ke-Bang is blowing up (lol). I have to imagine it’s just a matter of time before this town gets huge with really nice hotels rather than just the standard backpacker fare. There’s adventure to be found at all price ranges from walkways for like $15 to cave diving and camping in Son Doong for over $3000. 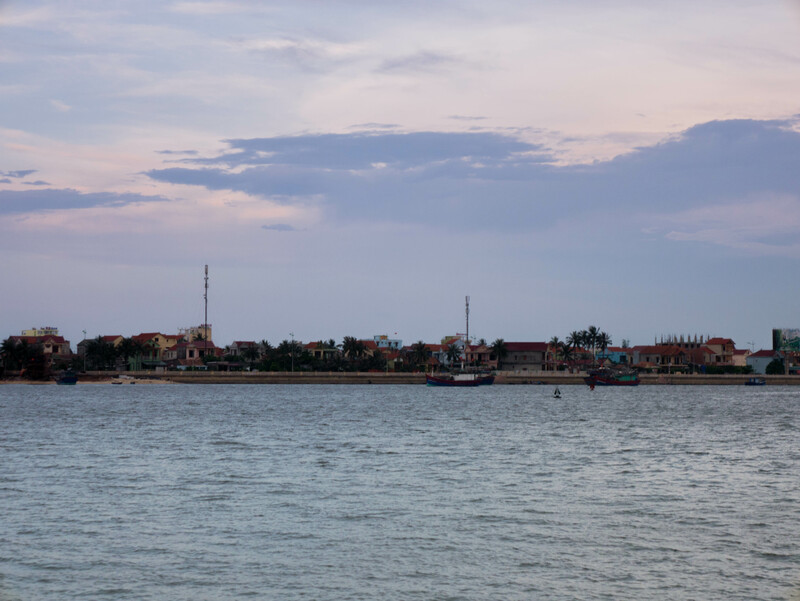 The site has all the ingredients for a popular tourist site in Vietnam. The most accessible caves are increasing in ticket price every year, and we only really had the budget to visit one of them: Paradise cave. Can’t do this cave justice with pictures. Enjoy. Paradise cave was one of the most incredible places I’ve ever been, and we only scratched the surface. We only walked a (lighted) kilometer of the cave on wooden walkways, while the full thing is almost 32km long. The experience made me want to become a cave diver so I can get to explore further, but alas the dream is so great and my income is so small. Caves are a proverbial final frontier of exploration, because of the technical skill and gear required to explore them. 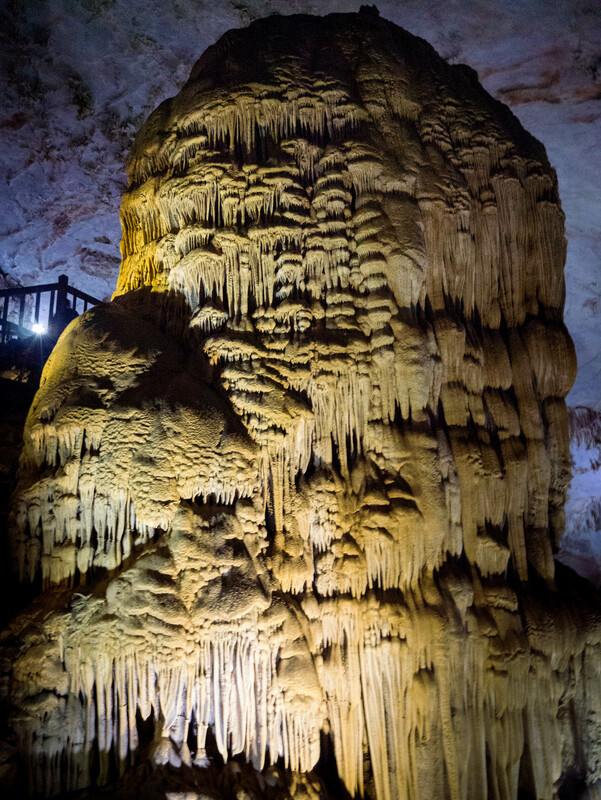 It’s entirely plausible that the largest cave system in the world remains undiscovered. We’re going to end our trip in Vinh in about 200km. Sophie has a flight to catch, so we’ll take a bus to Hanoi from there. Vinh to Hanoi isn’t a particularly interesting stretch of the trip, and we’re tired of Highway 1. Preferrable to spend more time up here in the jungle than getting blown around by trucks and busses.